Endosymbionts by origin, over time mitochondria have earned a central role in the functioning of eukaryotic cells, including those of man. Mitochondria are the site of respiration, various metabolic programs and the mitochondrial surface has emerged as a hub for signaling processes, such as the detection of foreign genomic material in innate immunity, calcium flux or the nucleation of autophagic membranes. This creates a tight link between mitochondrial fidelity and overall cellular health and may contribute to the fact that mitochondrial dysfunction is linked to a number of neurodegenerative diseases such as Parkinsonism, Charcot-Marie-Tooth disease, optic atrophy disorders and others. It has become particularly clear that damaged mitochondria are a source of trouble the cell needs to mitigate. 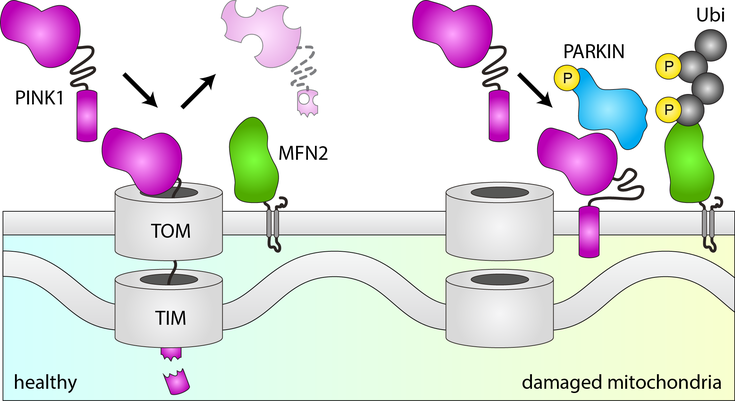 Proteins at the mitochondrial surface such as mitofusins are multiply involved in this challenge, as they not only control mitotic fusion events which can rejuvenate wounded organelles but can also themselves be turned into beacons that signal for the catabolic removal of mitochondria in a process termed mitophagy. Despite extensive research in recent times, mitochondrial dynamics remain poorly understood. Modification of mitochondrial surface proteins by PINK1/PARKIN in response to mitochondrial perturbation. We want to dissect the complex regulation of mitochondrial turnover and signaling events under different conditions using loss-of-function genetic approaches coupled to fluorescent readouts and deep sequencing. This includes the search for genetic suppressors of mutant phenotypes associated with mitochondrial dysfunction as well as unbiased surveys for hitherto unknown factors in signal transduction at the surface of the organelle. 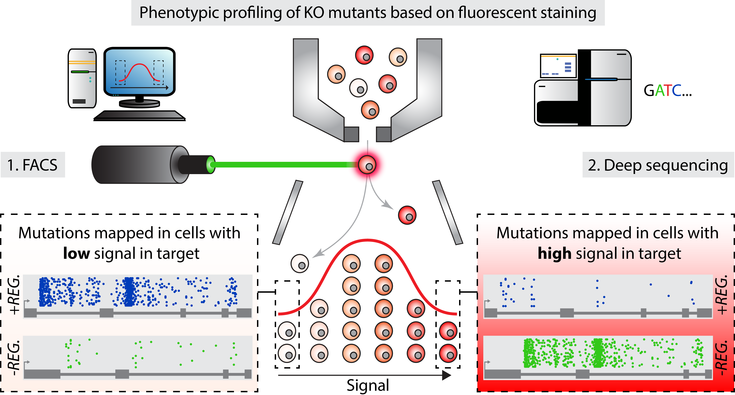 FACS-based haploid mutagenesis platform for the genetic dissection of phenotypes quantified by a fluorescent readout.